Want to make an impression at your next trade show or product launch event? 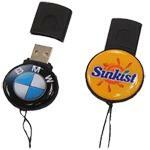 Then try these eye-catching dome flash drives. They’re compact, easy-to-use and available in a variety of megabytes and gigabytes. Have your company name customized on one or both sides, so the recipient remembers who this convenient gift is from. You can even preload a power point presentation about your company.